Marcus J. Molinaro (born October 8, 1975) is an American politician currently serving as County Executive of Dutchess County, New York. A Republican, Molinaro served in the Dutchess County Legislature and the New York State Assembly before being elected County Executive for the first time in 2011. Molinaro is a former mayor of Tivoli, New York; when he became mayor at age 19, he was the youngest mayor in the United States. Molinaro was the Republican candidate for Governor of New York in 2018, but lost the election to incumbent Gov. Andrew Cuomo. Molinaro was born in Yonkers, New York. His family moved to Beacon, New York, in 1980 and to Tivoli, New York, in 1989. Molinaro graduated from Dutchess Community College in 2001. Molinaro was first elected to public office at the age of 18 in 1994, when he was elected to the Village of Tivoli's Board of Trustees. In 1995, he became the youngest mayor in the United States when he was elected Mayor of Tivoli. Molinaro was re-elected mayor five times, and also served in the Dutchess County Legislature. In 2006, Molinaro was elected to represent the 103rd District in the New York State Assembly. Molinaro served in the Assembly until 2011. In January 2011, at the recommendation of Assembly Minority Leader Brian Kolb, Governor Andrew Cuomo appointed Molinaro to serve on the Governor's Mandate Relief Redesign Team. Molinaro announced his bid to succeed twenty-year Dutchess County Executive William Steinhaus in May 2011. The campaign was endorsed by the county's Republican, Conservative, and Independence parties. On June 3, Beekman supervisor Dan French was nominated as the Assemblyman's Democratic challenger. Molinaro prevailed on November 8, 2011 with 62% of the vote. Molinaro was sworn into office on January 1, 2012. In 2015, Molinaro was re-elected to a second term, defeating Democratic challenger Diane Jablonski by a significant margin. In 2014, Molinaro was awarded the Pace University Land Use Law Center’s Groundbreaker’s Award. As County Executive, Molinaro spearheaded a 2015 initiative called "Think Differently" for people with disabilities; he also appointed a Deputy Commissioner of Special Needs in 2016. In 2015, Molinaro was elected Second Vice President of the New York State Association of Counties. In March 2018, Molinaro informed Republican leaders that he would run for Governor of New York in the 2018 election. Molinaro announced his candidacy on April 2, 2018 and was endorsed by the New York Conservative Party on April 13. On May 23, 2018, the Republican Party unanimously nominated Molinaro as its candidate for Governor of New York at its state convention, three days after the Reform Party endorsed Molinaro for their gubernatorial ticket. Molinaro's running mate was Julie Killian, a former Rye City Councilwoman and State Senate candidate. Molinaro lost the 2018 gubernatorial election, garnering 36.8% of the vote. Molinaro and his wife, Corinne Adams, reside in Red Hook, New York. Molinaro had two children with his first wife; he and Corinne have one child and are expecting another. Molinaro's daughter, Abigail, is on the autism spectrum. ^ "Marc Molinaro on Twitter". Twitter. ^ Barry, John (April 2, 2018). "Marc Molinaro: A Timeline of his career". Poughkeepsie Journal. Retrieved September 16, 2018. ^ Segers, Grace (April 3, 2018). "5 things to know about Marcus Molinaro". City & State New York. Retrieved September 16, 2018. ^ De Avila, Joseph (May 23, 2018). "New York Republicans Nominate Dutchess County's Marc Molinaro for Governor". Wall Street Journal. Retrieved September 16, 2018. ^ "Governor Cuomo Announces Members Of The Mandate Relief Redesign Team". Retrieved March 10, 2018. ^ "DUTCHESS COUNTY EXECUTIVE RESULTS: Molinaro beats French handily". Dailyfreeman.com. Retrieved January 4, 2017. ^ Ferro, John (November 3, 2015). "Molinaro wins reelection as DC executive". Dailyfreeman.com. Retrieved March 10, 2018. ^ "Molinaro tells more GOP leaders he's running for NY governor". NorthCountryPublicRadio.org. March 8, 2018. Retrieved March 10, 2018. ^ John W. Barry and Joseph Spector (April 2, 2018). 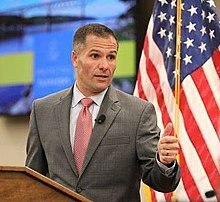 "Marc Molinaro: Candidate for governor cites "rendezvous with destiny"". Poughkeepsie Journal. Retrieved April 2, 2018. ^ Lovett, Kenneth. "NYS Conservative Party leaders back Molinaro for governor - NY Daily News". Retrieved May 22, 2018. ^ Blain, Glenn. "Marcus Molinaro accepts New York GOP nomination for governor - NY Daily News". Retrieved August 31, 2018. ^ Vielkind, Jimmy (May 20, 2018). "Reform Party nominates Molinaro, backs Bharara for attorney general". Politico. Retrieved November 12, 2018. ^ Lovett, Ken (May 20, 2018). "Marcus Molinaro picks ex-Senate candidate Julie Killian to be running mate". New York Daily News. Retrieved May 20, 2018. ^ "Live map: 2018 midterm elections results". Axios. Retrieved 2018-11-12. ^ "County Executive Marc Molinaro, Wife Corinne Welcome Baby Boy". Northwest Dutchess Daily Voice. Retrieved April 3, 2018. ^ "New York State Unofficial Election Night Results". Retrieved November 7, 2018. This page was last edited on 24 February 2019, at 16:50 (UTC).